The University of Sheffield in England has a global reputation for Computer Science. Professors Roger Moore and Thomas Hain are the who’s who of UK Spoken and Natural Language Processing. gweek provides bite-sized analysis and learning in communication skills. We are the originators of the term Speech Intelligence. We are multi-award winning for our innovations around Natural Language Processing. When gweek re-headquartered in the UK recently, Sheffield was high on the list for where to start our speech technology talent search. This time, in 2017, we got lucky. Not so the first time, when in 2012, we made our first outbound calls looking for partners to start working on gweek’s automation. Phoning around the UK’s universities got us nowhere. The sort of thing we did just wasn’t on the radar. Fast forward to 2017 and we were lucky enough to find a talented array of specialists, led by Dr. Saeid Mokaram, to get us all the way to gweek 2.0. Now in 2019, it’s a pleasure to be working also with Sheffield’s data scientists, in a joint project to unearth more insights from gweek. Our mission at gweek is to be evidence-based and research-driven. 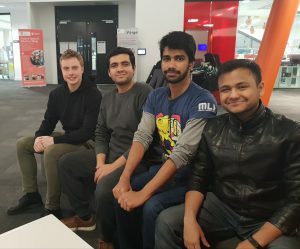 Thanks @shefcompsci to Rahul, Ibad, Martin and Abhijeet for choosing to work on Project gweek! We hope this blossoms into more collaboration between us.